St. Joseph's Day is celebrated on March 19th every year. 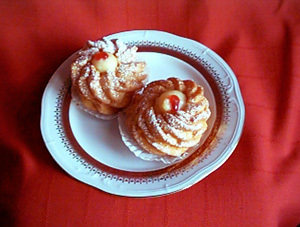 On this day, the feast of San Giuseppe, every Italian household makes its version of zeppole, or cream puffs. The cream puff shells can be made ahead and frozen, and the filling can be made a day before serving. The lard is what makes the recipe authentic, but you may use all butter. Preheat oven to 425ºF (220ºC). Grease and flour a cookie sheet or line with parchment paper. In a heavy saucepan, heat the water, add the butter and lard, and when melted, remove pan from the stove and add the flour mixture all at once. Beat with a wooden spoon, then return the pan to medium-high heat, beating the mixture until it comes away from the sides of the pan. Remove the pan from the heat and add the eggs one at a time, beating with a wooden spoon or hand mixer to blend each in well before adding the next egg. Fill a pastry bag fitted with a 1/2-inch plain nozzle with some of the cream puff mixture. Squeeze out 1 1/4-inch puffs about 1/2 inch apart on cookie sheet. Bake the cream puffs in preheated 425ºF (220ºC) oven for about 20 minutes or until golden brown. When done, carefully slit the side of each cream puff with a knife to allow steam to escape and prevent the puffs from becoming soggy inside. Transfer the cream puffs to cooling racks. In a small bowl, mix the potato starch (or cornstarch, if using) and sugar for the filling. Set aside. In a medium saucepan, heat the milk and butter over medium-high heat until the butter melts. Add the starch mixture and cook over medium heat until it starts to thicken, about 2 minutes. Remove the mixture from the heat and slowly add the eggs, beating well. Return the mixture to the heat for just a few seconds to cook the mixture, being careful not to scramble the eggs. Pour the filling into a bowl, add the almond extract, and blend. Cover with buttered waxed paper and refrigerate until ready to use. Use a small knife to cut off the top third of each cream puff. Add about 2 teaspoons filling (more if the puffs are larger), replace the tops, and put puffs on a decorative platter. Dust with confectioner's sugar and serve immediately. Fill cream puffs with jam, chocolate cream filling, or ice cream. Drizzle chocolate sauce over the top and place a maraschino cherry over each Zeppoli, instead of confectioners' sugar. This is one of the best Zeppole recipes I have come across online. Excellent recipe-but use baking powder, not baking soda, that is why joe Dacosta had flat dough. I fry them just like they do in Italy, Good recipe comes out great. My mom and I attempted them yesterday. The batter was too soft so they didn't keep their form. We used baking powder as opposed to baking soda, but they didn't rise enough. They didn't rise...a total waste of really good ingredients. The reason people's Zeppole's aren't rising is most likely because the way the recipe is written, it is likely they put the eggs in while the flour/butter combo was too hot. Let it cool off before adding the eggs. Also, unless you're some kind of Adonis, mixing in the eggs by hand can be quite a feat. I used a Kitchen Aid and it turned out fine. As for the cream, there is way too much almond extract for my taste; I recommend 1/2 tsp. each almond and vanilla extract for a more normal taste. Be careful adding the eggs in the cream mixture as well. Overall, I agree with the reviewer who said these are the best Zeppoles he found online; they are the most authentic for those of us who are used to NYC/NJ style Zeppole's. I think they could probably use a little sugar in the pastry part as well, but I didn't try adding any, so I'm not sure about that. Happy St. Joseph's Day! I made 24, and they were just right not to small. Also I made an extra batch of the cream, because I like my Zeppoles with a good amount of cream. Everybody who tasted them loved them and said they were really great. Now I have to make them instead of buying them, but I agree not to toot my own horn but they are excellent. I have been making this recipe for a few years now. I prefer spooning the dough onto the baking sheet instead of using a pastry bag. They don't exactly "rise up" but they do puff up like a ball so when you cut them to fill, the cream does not ooze out, Also I beat the eggs before adding them to the mixture, the mixture needs to be warm, add a little at a time and mix quick, you wont scramble the eggs. Note: Baking powder, baking soda,or cornstarch ... all need to be fresh. I also make my custard a few hours before and refrigerate until its cold so it kind of congeals. I then put it onto a Kitchen Aid Electric mixer with the wire whisk attached, and add about 1/2 to 1 cup of heavy whipping cream, then beat into a smooth thick creamy custard. I also add 1/2 tsp. of vanilla and almond extract, instead of all almond. The taste of the cream is to die for.